For this review I’m going to tell you a quick story about a couple I recently helped when remodeling their kitchen. They had been saving for a long time so they could have their dream kitchen so I felt I had to make sure they got exactly what they were looking for (no pressure!). Incidentally, both of them were avid cooks so it was important the finishing touches suited them. It was an absolute breeze dealing with this great couple, until we got to the point where we were deciding on the style of kitchen faucet they wanted. You see one half of the couple had a more rustic sense of style while the other was more concerned about convenience. We looked at many models, some of which you will find on my website but nothing seemed to “fit the bill”, until I finally showed them the Delta 21966LF-SS Dennison. At once this was met with murmurs of approval. This kitchen faucet is a two handle bridge design. 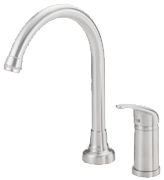 The spout arcs nicely over the sink and has the ability to swivel 360 degrees (great for convenience). It sits in the middle with one lever for cold and one for hot either side. In addition, you also get a matching side spray. The overall impression is a device that wouldn’t look out of place in a farmhouse style kitchen, yet because of the brilliance stainless steel finish it will fit well in a more modern décor as well. As I’ve mentioned the spout does swivel but it also stands at a height that’s convenient enough so you can easily fill large pots and pans. The side spray is incredibly well insulated which means (unlike other models) you won’t burn your hands when using it with hot water. The side spray is also perfect for rinsing your sink without having to splash water everywhere and you can wash fruit and vegetables with ease. Overall this kitchen faucet glides very smoothly when you use it, and it actually looks a lot more expensive than it is (another plus for my customers). So the above information dealt with the two main things my clients were looking for but just for you, I’ve also included some other features you might want to know. It’s ADA compliant – However, you MUST make sure it has been installed properly. This isn’t just so you can ensure the faucet is deemed ADA compliant, it also stops some of the complaints I’ve come across like a wobbly spout. 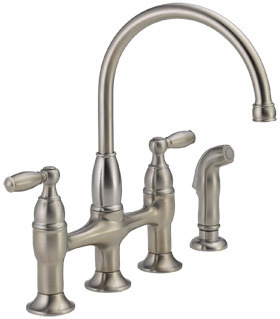 The overall finish Delta has used means this faucet is resistant to hard water spots and fingerprints. This kitchen faucet is California and Vermont low lead compliant. The manufacturer also offers you a limited lifetime warranty on the faucet and finish. My customers decided to buy this kitchen faucet and are incredibly pleased with the results both in terms of style and convenience. If you would like to find out more, why not take a look at Amazon? They generally have plenty of these in stock, offer fast delivery and great discounts.